Have you ever heard about ice bars where drinks are served in ice glasses? Do you think it is only possible in other countries? Well, Goa is one such city in India where tourists get the option to visit Ice Bar. It is located in the Snow Park. A wide array of fun-filled activities is offered at the Snow Park. Among these, the ice bar is an exciting thing to experience. 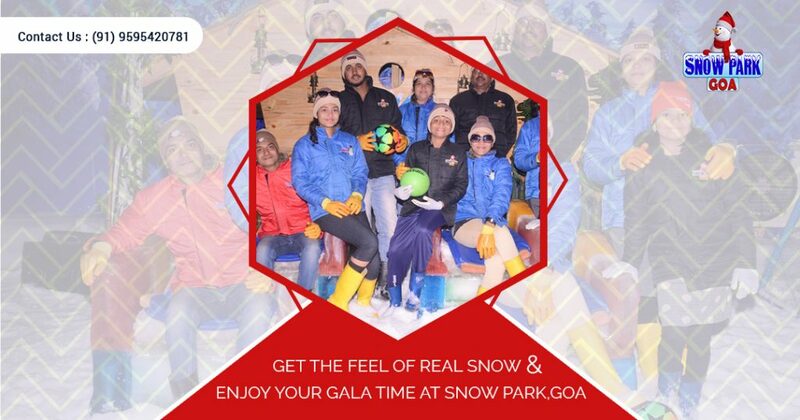 If you happen to visit Goa for the first time, when looking for the best attractions in Goa, you are sure to come across Snow Park. It is seen that tourists travel to this place from all over the world to enjoy Snow Park. Ice bars in Goa? Yes, you heard it right. Snow Park offers an amazing set up of permanent ice bars. The constant temperature of the place prevails towards the negative side of the degree scale. Ice bars are sure to surprise you with its ice sofas, ice glasses and many more made from only ice. Order your favorite liquor at the counter in ice glasses and enjoy it with your family and friends. Does it sound like fairyland? For the ones who are visiting it for the first time might seem to be even more than a fairyland. Entry fees are required for entering the bar. Depending on the fee, the person is allowed for a certain span of time exceeding they have to pay extra. Much to your surprise, walls and ceiling are also made from ice and they will surely not melt. Also, photographers are present inside the bar that is ready to capture some exciting moments of your life spending in the bar. Are you worried about taking your children along? Children are welcome in the ice bar as colorful drinks are available for children as well. This place is located at the heart of the city making it convenient for tourists to easily spot the location. With a tinge of a feeling like an arctic world, you are sure to enjoy at the bar and look forward to visiting the place next time you go to Goa. So, go for a round of your favorite spots in wonderful ice glasses. You are sure to get the cocktail of your choice but you might find it with some different name at the ice bar counter. Therefore, if you happen to love experience ‘out of the box’ excitement, visiting this sub-zero place will be absolute fun on your next vacation. Though, there are other ice bars being set up in other cities, the decorum Goa’s only ice bar is sure to take the lead. So, pack your bags soon and head towards Goa to visit the amazing snow land at the ice bar and experience some excellent time. Click pictures, post them and cherish the experience forever amidst the ice bar. It is worthy of visiting for your next vacations.